This jumpsuit has me smiling and feeling like Barbie. What's better than wearing head-to-toe pink, and the fact that it's a jumpsuit is even better. I found this at one of my longtime favorite stores, Trina Turk. It's hard for me not to like everything she comes out with every season since it is always bright, bold and colorful. I love how jumpsuits can be dressed up or down, and how this one piece can totally make an outfit. I know I'm not alone when I get a little worried before wearing a jumpsuit. Not only can they be a challenge when you have to pull them up and down during a night out, they can also look sloppy, ill fitted, and unflattering. But, when they look good, they look good. Here are some tips to keep in mind next time you're in the market for, or planning to wear a jumpsuit. Finding the perfect fit is critical for jumpsuits. You don't want it too tight or too loose. Tailoring is so important, so be sure to shop around for one that fits YOU, not one that looks great on the next girl. I find that halter style tops and ones with cap sleeves look unanimously good on every body type. Showing off your figure is important. Since a jumpsuit is one solid piece, be sure that your waist is defined. A cinched waist is great for drawing the eyes both up and down, as well as showing off the smallest part of your body. It'll also make your legs look a mile long. If the jumpsuit doesn't have a natural built in cinch, add a belt. It will also help break up the head-to-toe color or print you are wearing and give you the perfect fit. Like I just said, adding a belt is a great way to do this. Also, add dimension by topping your jumpsuit off with a blazer. You could also layer a lace long-sleeve shirt or one with a collar under a sleeveless or strapless jumpsuit, making your look really unique. If you're wearing a bold color like I am, keep your accessories neutral and all in the same color scheme. If you are wearing a wide leg jumpsuit, like I am, you must pair it with heels. I would stay away from platforms, unless you're going for a 70's disco vibe. If you're wearing a casual jumpsuit that is made of lycra or jersey and is straight legged or tighter at the ankle, pair it with sandals or tennis shoes. 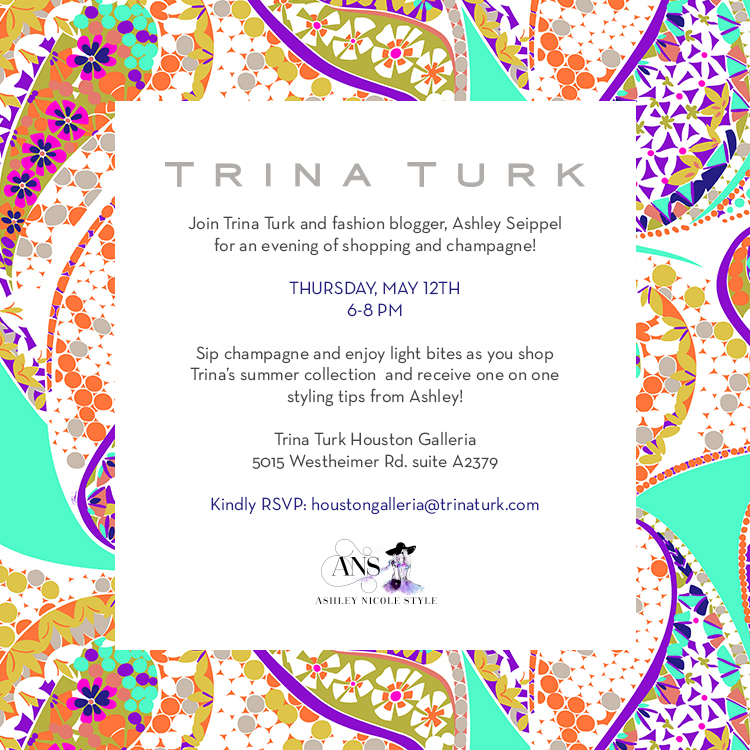 Join me tomorrow night from 6-8pm at the Trina Turk Boutique in the Galleria. There'll be champagne, light bites, and lots of shopping (all full price merchandise will be 20% off)! The Summer 2 collection just debuted last week and it is amazing - you definitely don't want to miss it. Plus, there's an amazing goody bag! Who doesn't like some swag?! There's not guest list, so feel free to invite your friends, family or colleagues. What better excuse for a GNO! Obsessed with this look! Thanks for paring it with our bag. This is seriously fantastic!! I love that color and how flattering it is! Hi Maggie- It is available at our Trina Turk Boutique in the Houston Galleria!! Give us a call and we can have it ready for you!